People often come in at this time of year saddened that there’s not much colour in their garden. This can often be attributed to the ‘Spring Gardener’ who does all of their planting in the spring and only in the spring. This year is proving to be especially bad for running out of colour as many plants are about three to four weeks ahead of schedule, which means they’re finishing early as well. One of the first plants I usually recommend for late season colour is the echinacea, but if you read my last column, then you’ve cut back the flowers on your echinacea. They should be back in all of their glory next year, but that still leaves a lot of green for this year. Don’t worry. There are lots of plants that can keep your gardens blooming right up until frost, and even beyond in some cases. Mums are an obvious choice and you can’t miss them. Everyone sells them from the big box stores to the little Mom & Pop places. Sorry. The pun was intended. Again, sorry. Mums aren’t the only annuals that add late season colour. Asters put on a great show and have the added advantage that they will usually come back. Growers have always included them with the fall annuals, but many of the varieties that show up as annuals in the fall are also in our perennial section. Snapdragons and pansies will bloom well after the first frost. The pansies will normally come back next spring too. Purple Fountain Grass and Millet are great choices for adding some colour and height and they’ll still look good after a hard frost, they’ll just stop growing. Their seeds will also provide some much appreciated nourishment for the birds. Flowering cabbage and kale also look great into the fall. They will actually develop better colour after a hard frost and most will keep their shape well into the winter. There are plenty of late blooming perennials to keep you going as well. Fall blooming crocu s and Colchicum produce leaves in the spring, then disappear, only to reappear in the fall with blooms. 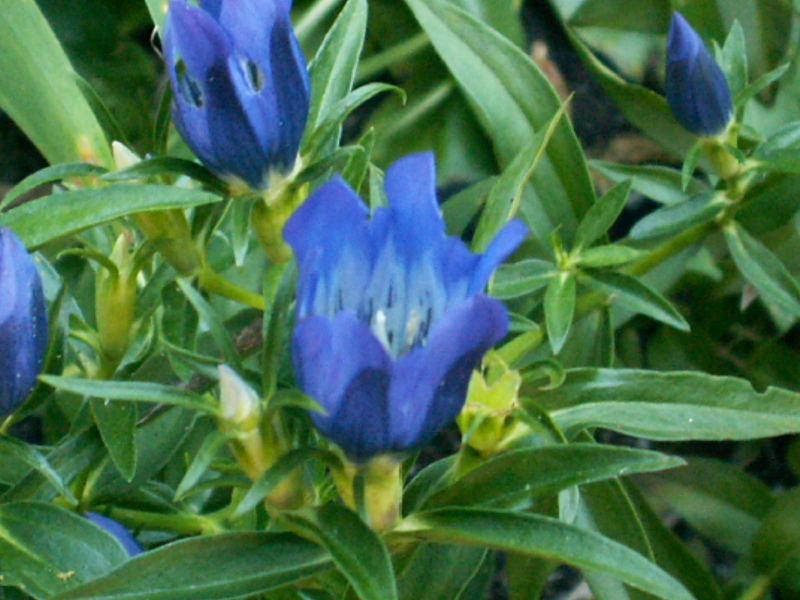 Gentiana (the one in the photo) is a great blue flower that is just starting to bloom in my garden. Ceratostigma (leadwort) is another late season blue flower that develops red leaves when the nights start to get cold. Perennial hibiscus are a personal favourite of mine. The flowers are huge and showy and continue until frost. Did I mention huge? Another personal favourite is Nipponanthemum (Japanese daisy). It blooms so late that some years, if we get an early frost, doesn’t get to bloom. But it’s succulent-like leaves make it a good addition to the garden and those years that it does bloom (this will be one of those years) seem to add a little wonder and excitement to the garden. Fall blooming clematis are another great choice. Sweet Autumn is a strong growing clematis that will be covered in small, fragrant white blooms. Red Shift coreopsis has small bright yellow flowers from summer until frost. When the nights turn cold, the red centres kind of bleed out until the flowers are completely red in the fall. Sedums, lobelia, Russian sage, perennial sunflowers, joe pye weed and Vernonia are are all late bloomers that will help keep your sunny garden colourful. There are late blooming perennials for the shady garden as well. Anemones (wind flower) have flowers in white and various shades of pink that are held well above the foliage and dance in the wind. Fall monkshood offers great blue-purple flowers on tall sturdy stocks. Just be careful with this one as it is poisonous. One of it’s common names is wolfbane, because it used to be planted around villages in England to keep the wolves out. Bugbane has purple fern-like leaves with tall fragrant white spikes. Turtlehead have white or pink flowers that remind me of snapdragons. Another favourite of mine (I’m a plant nut – I do have a lot of favourites) is Tricyrtis (toad lily). They have small orchid-like flowers in pinks, blues and white, often with spots, on either upright or arching stems, depending on the variety.